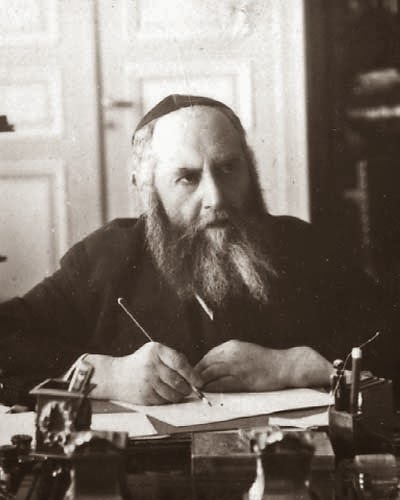 As much as he was a chassidic rebbe, Rabbi Yosef Yitzchak Schneersohn (known as the Rebbe Rayatz or Friediker Rebbe) also epitomized what it means to be a chassidic man of letters. The following is an extract from a discourse in which he describes the experience of turning lofty ideas into readable prose. As a writer it struck a personal chord with me, and I don't think it is overly presumptive to detect an autobiographical note on Rabbi Yosef Yitzchak's own part. This is a free translation of Sefer Hamaarim 5711, page 29-30, the discourse in question was first delivered in 1933. When revealing an intellectual matter or deep wisdom in writing, the hand writes what rises in the depth of his intellect with all the logical details of that intellectual idea. At that moment he has great pleasure from his grasp of that intellectual concept, and a great desire to explain it in in clearly written prose, each matter in its place, in systematic order. This is achieved specifically through his analysis and introspective contemplation while writing, attempting to find the phraseology and the precise language through which the deep concept will be revealed with clarity, without any mistake falling into any one of the logical elements. Through the power of his thoughts and his contemplation he finds such words that fit that deep concept, encompassing all the details of his logical idea in all their sharpness and precision. All the loftiest and most integral abilities and talents of his soul take a part in this. Mind and heart unite and act as one. Their unity is such that that each is effected by the other, though they are opposites by their essential nature. Mind and heart are respectively water and fire by their essential nature... the intellect is cold and collected, and emotion is hot and excitable. But in this unity the cold intellect is effected by the essence of emotion, becoming hot and burning with inspiration of the soul and the desire to reveal this deep concept. Likewise, the excitable heart is influenced by the essence of intellect to organize its experience in introspective thought and contemplation, in order to find the expressions and expressive language that are most fitting to reveal with deep clarity the logic of this deep concept. The capacities of the inner mind and heart join together in this activity. Although each of them is an entity of its own, they nevertheless reside in one place. Intellect, pleasure, will, thought, inspiration, and desire combine with one another and complement one another, and all as one join in this activity.